On 23 August 2018, the first 90 of 200 African buffalo were presented to the communities of Senior Chief Inyambo Yeta and Deputy Chief Joyce Sekute to further develop the Simalaha Community Conservancy, that forms a vital Zambian component of the Kavango Zambezi Transfrontier Conservation Area, or KAZA as it is known. KAZA is the biggest terrestrial cross-border conservation system in the world – connecting 37 protected areas across Angola, Botswana, Namibia, Zambia and Zimbabwe. The aim is to preserve large ecosystems across borders and re-establish corridors that allow free movement of wildlife along ancient migratory routes. 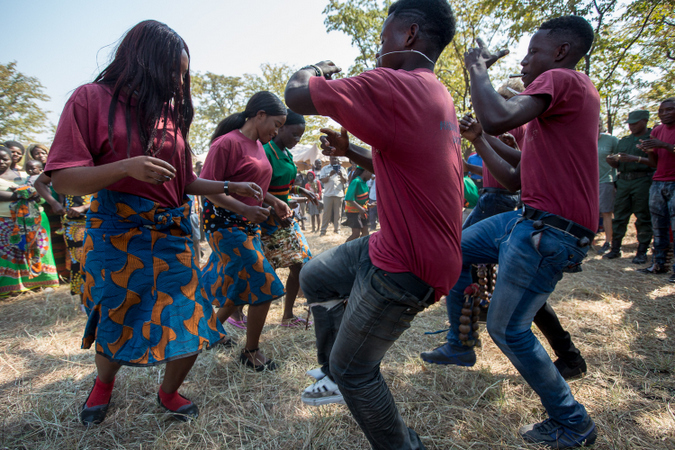 The Simalaha Community Conservancy comprises 180,000 ha of communal land and lies within one of six key wildlife dispersal areas in KAZA, namely the Chobe Zambezi dispersal area that reaches from Chobe National Park in Botswana to Kafue National Park in Zambia. The Conservancy was established in 2012 to ensure viable natural resource management and support wildlife conservation; to address basic human rights of the Sesheke and Sekhute people; and develop alternative models for income generation for these two communities. Income from wildlife management was identified as a critical component of the Conservancy and in 2013 a wildlife sanctuary measuring 24,000 ha was established as part of Simalaha. Through the active reintroduction of wildlife that used to occur in the area, and with the addition of the buffalo, the sanctuary now boasts eight different species totalling more than 1,600 animals. The buffalo were purchased from the Waterberg Plateau Park in Namibia, which had exceeded its carrying capacity for the species. 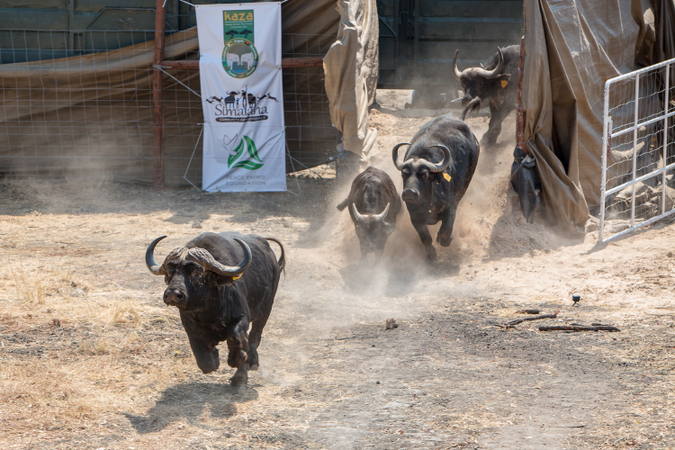 In July, 120 buffalo were captured and spent 30-days in a quarantine facility in Namibia where they were tested and monitored for any signs of foot-and-mouth disease. Ninety of the now certified disease-free animals were released into a 2,500-ha fenced section within Simalaha’s wildlife sanctuary, with the remaining 30 to be brought in next week. 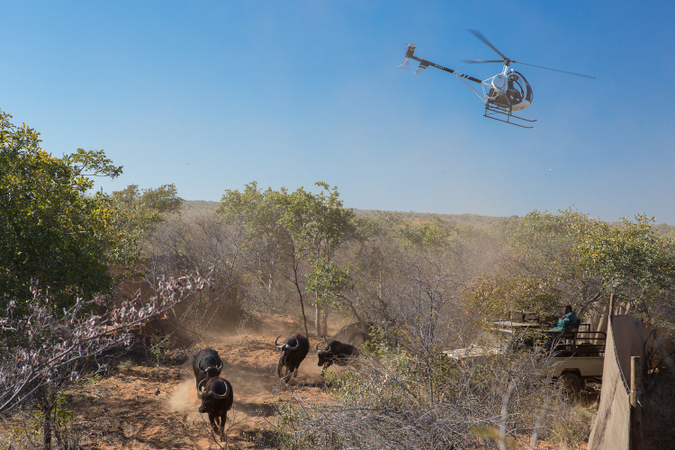 An additional 80 will be captured and transported to Simalaha in September, bringing the total to 200 buffalo. Providing disease-free buffalo to Simalaha was crucial, as this member of Africa’s popular Big 5 will not only boost the tourism offering, but will also generate income through the sale of the offspring of the buffalo to other areas in Zambia. Senior Chief Inyambo Yeta highlighted the fact that the totem animal for his Chiefdom was the buffalo. In years gone by, his chiefdom was responsible for defending their territory from invasion from neighbouring communities and through their efforts were given the totem animal of the buffalo, renowned for its fierceness and impressive defensive skills. “The buffalo are back! The buffalo are back! I never thought that I would see this happen in my lifetime!” exclaimed the Chief.